During 15-24 July 2006, active Baiu front continued to be located over Japan, and brought heavy rainfall which lasted for several days to western and eastern Japan. 7-day accumulated rainfall during 18-24 July exceeded 1,200 mm in the southern part of Kyushu in western Japan (Figure 1), which was above twice as much as monthly rainfall normal for July. At tens of stations in western and eastern Japan, accumulated precipitation during 15-24 July recorded above twice as much as monthly precipitation normal for July (Figure 2). Due to this prolonged and sustained Baiu frontal activity, the end of Baiu season, rainy season in Japan, was delayed for about 10 days from its normal dates in western and eastern Japan. 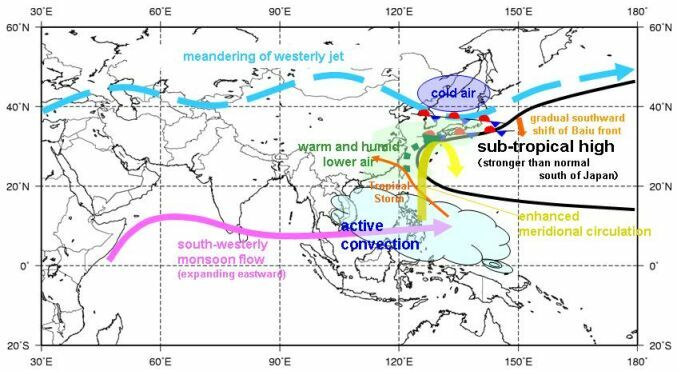 2. warm and humid lower-air continuously flowed into Japan along the western periphery of stronger-than-normal sub-tropical high south of Japan. These two flows met over Japan and made atmospheric vertical stability conditionally quite unstable. This condition was favorable for enhanced and sustained Baiu frontal activity. Around 15th July, the sub-tropical jet started to meander around Japan, and the meandering was most remarkable around 19th July, drawing cold and dry north-westerlies in the upper troposphere over Japan. Meanwhile, the sub-tropical high south of Japan kept stronger than normal during the period, dominating the warm and humid south-westerlies in the lower troposphere toward Japan along the western periphery of the sub-tropical high. It is thought that the sub-tropical high was strengthened by the active convection east of the Philippines, where an apparent monsoon trough was located and three tropical cyclones (T0603 "Ewiniar", T0604 "Bilis" and T0605 "Kaemi") were formed in July, possibly associated with higher-than-normal sea surface temperatures in the western Pacific.